I have never eaten stew with dumplings but when I saw the recipe and enticing photo in Isa Chandra’s cookbook Isa Does it, I had to make them. At first I wasn’t sure what to think of these little fluffy lumps of dough floating in a savoury stew but my tummy figured out pretty quickly that this was a great thing. Isa’s recipe takes about one hour from start to finish and is really very straightforward. I embellished a little by adding extra veggies, but essentially this is how Isa does it. Melt the margarine on medium heat in a large, wide pot that has a tightly fitting lid. Add the flour and heat through to make a soft roux – stir constantly for a couple minutes to cook out the raw flour taste but without burning the roux. Add the onions and garlic and sauté together for about 5 minutes. Add the broth and stir constantly using a whisk so that the flour is incorporated evenly and lump free. Add all the other ingredients and bring the pot to a boil. Once it’s boiling, reduce to a simmer and simmer for 25 minutes. Stir a few times during cooking. The stew is done when it’s nicely thickened and the potatoes and carrots are easily pierced with a fork. While the stew is simmering, make the dumpling batter. In a small bowl, sift in the dry ingredients. Okay, not going to sift? At least sift in the baking powder so you don’t end up with salty, crystalline lumps in your batter. Make a well in the dry ingredients and add the wet ingredients. Stir everything to combine – you will have a rather ugly looking batter and that’s okay. It’s not pretty, and I was very dubious about this whole dumpling thing at this point. When the stew is done simmering, drop the batter by spoonfuls on top of the hot stew. I got 16 dumplings that completely covered the top of the stew. Put the lid on the stew pot and let the pot simmer for another 14 minutes. No peeking! It’s the steam in the pot that cooks the dumplings. They will puff up and be nice and firm to the touch when they’re cooked, but will be cakelike on the inside. Here are the dumplings after steaming. At this point I was REALLY wondering what I had done. But ladle up a dumpling and some stew on top, dig in and it’s savoury heaven! Ladle the stew and dumplings out in a bowl. This dish makes 4 very satisfying servings and will last up to 3 days in the fridge. It makes great, microwavable leftovers. You end up with this, and this is DELICIOUS! These little cuties are savoury and satisfying. I love them served on a bed of millet with lemon tahini sauce and a big side salad. The original recipe is from Esther’s Kitchen (Esther being the Wonder Pig). I have made a few alterations and embellishments to the original recipe to amp up the flavour because that’s how I like it. Feel free to leave out any of the seasonings –the herbs, garlic, shallot/green onion or salt as you prefer…. But why? Why? You can eat these muffins hot or cold, they’re portable so they make a great snack or breakfast on the go, and they’re easy and affordable. What’s not to love? Heat the oven to 400F. Grease a mini muffin tin. Combine all the ingredients in a mixing bowl and stir until everything is incorporated and moist. Spoon into the muffin tin. Bake for 20 minutes. The muffins should be golden on top when they’re done. Mix everything together in a small glass or bowl. Whisk until well blended and spoon over the muffins. I get a cheap thrill fooling non-vegans into thinking they’re eating meat. This soup is as savoury and dark as any beef broth. However, in this case the beef is still very much alive enjoying his or her life happy in a field somewhere. My recipe is based on an ancient Moosewood cookbook, but with my own riff to make it more flavourful and less laborious. In a large pot bring the vegetable broth and the water to a boil. Break up your dried mushrooms into fingertip sized pieces and place in the boiling stock/water. Simmer for 15 minutes and remove the pot from the heat. In the meantime in a stock pot, dice up and slice your other veggies. Saute the onion, garlic, celery and carrots until the onions are translucent – about 5 minutes. Add the sliced mushrooms and cook until the mushrooms release their juices. I like to cook this right down so some of the mushrooms start to brown a bit. Add the dried mushrooms/stock/water mixture and an additional 1 cup of water and all the other ingredients and bring to a boil. Reduce to a simmer and simmer for 40 minutes. Remove the bay leaf and enjoy! I have always loved shepherd’s pie. It’s a gorgeous, classic comfort food. Now here’s a version that’s just as delicious as the original AND vegan. While the ingredients list and steps may seem long, I promise this is a simple recipe that will make you feel like a gourmet when it’s done. My next door neighbour, a venerable German lady and an excellent cook, came by to sample the dish and declared it to be buttery and sinful. I couldn’t ask for higher praise. 4-5 potatoes. I use Yukon Gold or any white fleshed potato. Scrub them well, remove any eyes, all or some of the skin and then dice. 1 white turnip peeled and diced. Trust me on this – the turnip gives the buttery flavour to the potatoes. 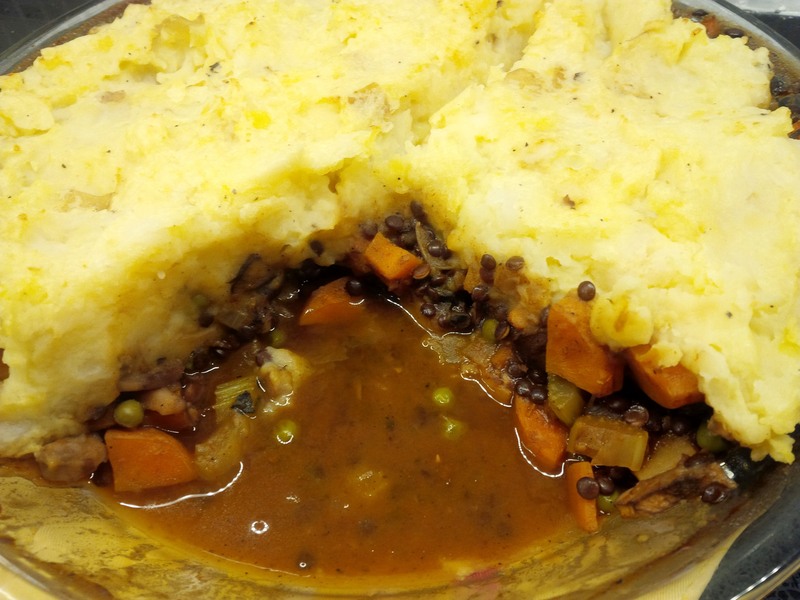 ½ cup beluga (black) lentils or any kind of lentils except red lentils, which get mushy. Boil the cubed potatoes and turnip together until they are soft. This takes about 15-20 minutes. Drain off the water. Add the margarine and milk and mash everything together. Season with salt and pepper to taste. Set aside. Put the lentils in a small pot with one cup of water. Put a lid on the pot and bring to a boil then simmer for 15 minutes. Set aside. In a large skillet or large pot (you want a wide based vessel), sauté the onion, celery, carrot and parsnip in the olive oil. Sauté on medium heat for about 5 minutes. Then add the mushrooms and sauté some more until the mushrooms have released their liquid. Add the tomato paste, flour, wine and half the broth. Stir well so the flour and tomato paste are blended well in the broth. Add the remaining broth, thyme, sage, salt, pepper, Worcestershire sauce, cooked lentils and peas and bring to a boil. Reduce to a simmer and let simmer uncovered until the liquid has reduced by about half. This will take about 15 minutes. When the filling is ready, pour it into a very large pie dish or other casserole dish. Top with the mashed potatoes and place under the broiler for 10 minutes until the potatoes are golden.